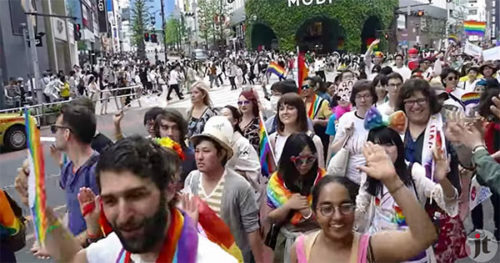 Japan’s gays, lesbians, bisexuals, transgender and queer people flooded into Tokyo Sunday for a rainbow-filled spectacular celebration of Pride. This year’s theme was “Change,” as JoeMyGod reported. This year’s marchers in the Shibuya district had the support of 190 corporations as well as local government officials. Carrying signs and waving flags, the marchers danced and strutted to the beat of upbeat, affirming music. Video from the Japan Times showed local celebrities waving from floats that passed its camera position.